This, the third week of March, is National Organize Your Closets Week. Now that you know this fun fact, I hope to motivate you to participate! Most people have clutter — just too much stuff. They go to the store and buy a bunch of containers. They get home and toss things in them only to discover the things don’t fit. Then they wonder why the containers don’t work and quit in frustration. Containers don’t create organization. 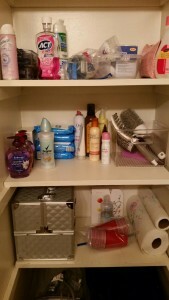 Getting organized is a process that I make easy and fun for my clients. Really! Here’s how to do it yourself. Let’s begin with a small project like a bathroom closet, under-sink cabinet or medicine cabinet. First label four bins Elsewhere (for anything that doesn’t belong in the bathroom), Donate, Recycle and Keep, and a trash can. De-cluttering is NOT the same as organizing, just the beginning of the process. The first step is a general de-clutter and sort. Pick a spot to start, pick up every item, in order, and put it in one of the bins or trash can. Continue until that space is empty. After eliminating the clutter, that’s when you organize what’s left. From the Keep bin, group similar items. Place them where they should go (e.g., which shelf, in front or back, near what other things). Only after you have grouped items should you buy containers that are the right size and shape to fit what is being contained. 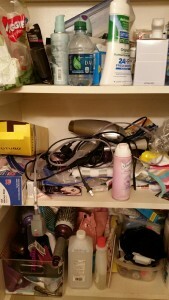 Let’s say you want to keep your most commonly used cleaning products together in the under-sink cabinet. Gather them together, measure how much space they take (height, length, and width) and include a little extra space to add a product or two. Do you want a round, square or rectangular shape? Handle or no handle? Take a moment to plan in advance so you get the right container. Clear containers make it easy to see what’s in them. If using solid containers, label them. Getting organized is about having homes for everything, having simple systems that work for you, creating new habits and maintaining the results. The benefits? Saving time and feeling less stress by knowing you can find what you need when you need it, saving money by no longer buying duplicates or triplicates of things you couldn’t find or forgot you own and knowing in advance that you’re running low on things so you can buy them when it’s convenient instead of racing to the store at the last minute. Being organized makes life simpler. In our frenetic world, maybe that’s the best benefit!